An access control system quite simply allows you to control who has access to your premises. Access control systems can operate doors, gates and barriers and are available in various installations such as telephone and video entry systems or computer-controlled systems operated by magnetic cards or proximity readers. Systems can be installed in a variety of premises including offices, factories and industrial sites, schools and colleges, hospitals, hotels and care homes. 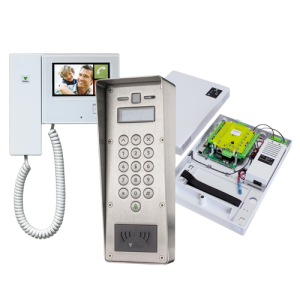 An access control system can also be connected to Building Management Systems (BMS) or CCTV system or intruder alarm to provide an integrated security solution. A door entry system which enables visitors to contact the premises occupant who will grant or deny access. These systems can be audio only or include video images of the visitor at the door. Door entry systems are often integrated it to access control systems. A standalone system which is the simplest, most cost-effective system. This type of system may be used to control access on one or many independent doors in a building. Access is gained by using a numeric code, or PIN with a keypad, or by presenting a proximity or magstripe token, depending on which type of reader is fitted. These systems are programmed at each door. If tokens need to be barred or codes changed, this action must be completed at every door on the system. A PC-networked system referred to as ‘PC based’ or ‘Networked’ access control, these systems may be used to control one or many doors in a building. Access is gained by using a numeric code, or PIN with a keypad, by presenting a proximity or magstripe token or by ‘possession’ with hands free tokens depending on which type of reader is fitted. PC based access control offers central control, via a network. Access Control technology is always evolving with developments in Biometric reader technology and building management integration, our surveyors will attend site to conduct a free survey, discuss your requirements and provide suitable options to fit your needs.